I knew the effervescence would be shortlived as she would soon examine the back of the tray for the price-tag. “Are you mad? Dh24 for ten pieces?” The glow in her eyes began to fade. I had expected it. “They might soon jack up the prices,” I said matter-of-factly. “Can’t help it. Coconut and rubber growers are committing suicide in droves. Kerala is the land of coconut, not jackfruit. Good Lord! For once my mother was right!” My voice tapered as I strolled to take a shower. The mention of my mother brought loads of memories. The jackfruit was proletarian once upon a time. As was the populace in my place. In the forgotten famine of the pre-Gulf era in Kerala, jackfruit wasn’t a dessert. It was the staple food, along with tapioca, that sustained the masses in hard times. I can’t believe Kerala now wastes an estimated 350 million jackfruit annually, which is about 75 per cent of the harvest. Reports say that more than Rs4 billion worth of jackfruit is wasted every year in Meghalaya, the highest producer in India. Back in the day, landlords gorged on the harvest as they had plenty of trees, while the landless poor and the middle class waited for trucks that unloaded mountains of jackfruits in markets occasionally. It was two rupees apiece, compared to the Rs200 today. Not everyone knew how to choose the best. To cut it open wasn’t allowed. Amma taught me the trick: The outer spikes should be blunt and smooth. Sharp spikes mean the fruit isn’t ripe. A pat on the fruit should elicit a cavernous sound. And don’t trust fruit with wavy or groovy exteriors. Impoverished kids invariably joined us when Amma oiled her hands and the knife to beat off the white gummy latex before she cut it open. Faces lit up as she uncovered the inner fruit: yellow and angel sweet. She never discriminated, giving an equal quantity to everyone. She was a communist. Occasionally, the landlords turned magnanimous and let the poor remove the fallen fruits from their homestead. For me, the jackfruit is the story of a bitter struggle for survival. Living abroad for decades I have rea-lised, if nostalgia has a colour, it’s jackfruit yellow. Fast forward to 2018. The jackfruit is enjoying a second spring. Thanks to a few entrepreneurs, health campaigners and industry lobbyists, the government has declared it the official fruit of Kerala. The aim is to take the fruit across the nation and abroad. 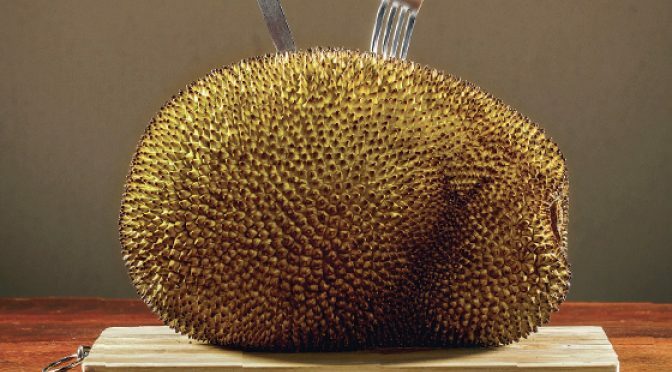 A total revenue of Rs150 billion is expected through the sale of jackfruit and its allied products after this official branding, according to Agriculture Minister VS Sunil Kumar, who also said the jackfruit is truly organic as it is produced in a natural way without using any chemical fertiliser or pesticides. Kerala rediscovered the drought-resistant, evergreen jackfruit after much research highlighted its goodness. As talk intensified of a green jackfruit meal being a healthy alternative to rice, meat and maida, people started to look at it as an elixir. The rest is history. Those who once got rid of the tree because of its voluminous defoliation started to re-cultivate it, to use at home and to sell. “In India, the demand is increasing due to enhanced public awareness. Already farmers have started commercially planting jackfruit in Kerala. Its impact on the local economy and job creation will be visible in a couple of years,” says Dr P. Rajendran, associate director of research at Kerala Agricultural University. The government also has plans to set up a research station and distribute saplings to land holders. Jackfruit is one of the most utilitarian trees. Its wood, next to teak in terms of quality and durability, is widely used for making furniture and houses. Nothing of the fruit goes waste. Raw jackfruit, cooked like a vegetable curry — boiled, mashed, and sauteed with coconut and spices — is popular among Indians. When ripe, it is eaten raw or made into jackfruit halwa with jaggery, coconut and ghee, laced with cardamom. The seeds of the jackfruit, when cooked and sauteed with spices, is a sought-after side dish. Like the fried jackfruit chips, the seeds (boiled, baked or roasted) are a tasty evening snack. Roasted seeds can also be made into flour. The spiky green jacket is used as cattle-feed. James Joseph, a jackfruit entrepreneur, was lured by the fruit to quit his high-paying job as a Microsoft director and return to India. Back in his hometown Aluva, Kerala, he worked with a chef to create a jackfruit burger coated in jackfruit seed crumbs that he found more delicious than the potato burger at McDonald’s. “The actual eureka moment happened when we created a jackfruit pie, spectacular and more delicious than the apple pie and pecan pies I had in the US. That was when Jackfruit 365 truly took off,” he says in a media interview. Jackfruit 365 sells the fruit in a packaged, freeze-dried form. Wifey — armed with a pen and paper — was lost in thoughts as I finished my shower and came out. “Are you kidding? I thought for once you are such a romantic husband who takes care of my likes and dislikes.” She creased her face in annoyance. Ten jackfruit seeds arranged as a smiley in the white tray winked at me. Her sari pallu in jackfruit hues graced my face as she turned on her heel and strutted towards the kitchen.